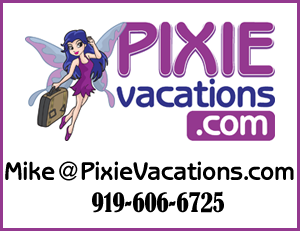 As you might have heard on this past Friday’s Friendship Friday post, I am a new travel agent with Pixie Vacations! This is a journey that started way back on September 8, 2010, the day that I started My Dreams of Disney, and continues to this day as I learn more about what it takes to be a Pixie Travel Agent! With this post, I wanted to take a moment and share with you all of the incredible Disney experiences that are waiting for you to discover when you call on me to help plan your next Disney vacation! As a Pixie Vacations Travel Agent, my services are available to you free of charge — give me a call at 919-606-6725, or send me an email to Mike@PixieVacations.com, and I’ll be happy to work with you to help you come up with the perfect vacation for you and your family! However, Pixie Vacations is a full service travel agency, so if you want me to research cruises other then Disney, or other vacation destinations, I can do that also! Aulani Resort, located at Ko Olina on the island of Oahu! Where will your dreams take you today? Check in with me and I’ll help you plan the magical vacation that you and your family deserve! Thanks for stopping by! Next Post: Tiggerific Tuesday Trivia – Herbie Rides Again!